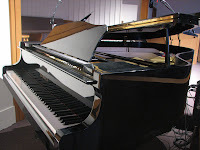 We have a new piano in the sanctuary at our Riverfalls building. A church member saw our elder's update that expressed our desire to replace the piano we use each week and generously gave us theirs! Ironically, we won't use it this Sunday since we'll be at West Linn High School. As the husband of one of the pianists who's going to really enjoy this . . . THANK YOU SO MUCH. We moved the other one downstairs and are trying to get rid of the upright grand in the multi-purpose room. If you are interested, please contact Judy in the main office.